6/16/13 - SAN DIEGO — Army 1st Sgt. Chris Montera, who lost both legs above the knee and suffered third-degree burns over 60% of his body in a mortar attack in Afghanistan, is doing a headstand, guided by yoga instructor Sunny Keays. "It takes a lot of pressure off my back and spine," said Montera, 33, who was on his fourth combat tour when he was hurt. "It helps with the pain." Marine Sgt. James Bernard, 25, who returned from combat in Helmand province in Afghanistan with a severe case of post-traumatic stress disorder, is going through a series of stretching, relaxing and breathing exercises nearby, under the gentle guidance of yoga instructor Barbara Lyon. Bernard's wife, Keely, 25, said yoga is helping her husband regain the composure and self-confidence that he had before he went to war. She accompanies him to yoga classes at Naval Medical Center San Diego. "He seems more aware now of who he is," she said. To help military personnel overcome the physical and emotional wounds from the wars in Iraq and Afghanistan, hospitals run by the military and the Department of Veterans Affairs are increasingly turning to the ancient Hindu practice of yoga and other alternative therapies, including tai chi, transcendental meditation and Reiki. Although not a cure-all, such therapies can be helpful when used in conjunction with Western methods of counseling, medication, and physical and occupational therapy, according to military officials. Preliminary military studies have found that the calming effect of yoga can assist PTSD patients in dealing with the hypervigilance, flashbacks, depression and anxiety common to the condition. For veterans with traumatic amputations, yoga can help strengthen muscles and increase flexibility, the studies suggest. "There's a natural resonance among our warriors with things with an Eastern ethos, with things that the samurai might have used," said Navy Capt. Robert Koffman, a physician and combat-stress expert at the Walter Reed National Military Medical Center in Bethesda, Md. "Yoga is something that our warriors will actively engage in: It's a challenge and it has readily evident results," Koffman said, particularly when patients adopt it as part of their lifestyle. As soon as Bernard leaves active duty and moves with his wife and their 3-year-old daughter to Mesa, Ariz., he plans to find a yoga instructor, either through the VA or a private studio. "Yoga's been helping people for thousands of years. Now it's helping me," he said. At the San Diego hospital, classes offered at the therapy room of the Comprehensive Combat and Complex Casualty Care facility are often part of a regimen to get a patient ready for even more rigorous forms of exercise. Marine Pfc. Isaac Blunt, 22, is in the yoga class to prepare to climb Australia's Mt. Kosciuszko. He lost both legs above the knee and the sight in his left eye in Afghanistan. During the mountain climb, he will wear his "stubbies," Blunt said, a term for an initial set of prosthetics provided to amputation patients. Like Montera, Blunt practices headstands in his classes. In yoga terms, they are called "inversions." The wounded personnel have a more graphic term: "draining the stumps." The rush of blood to the chest and head can be exhilarating. The first time one Marine lieutenant did a headstand at the class, he refused to come down, saying he was pain-free for the first time since his injury, an instructor said. Marine Staff Sgt. Mark Zambon went to yoga classes at the hospital four times a week as he prepared to climb Africa's Mt. Kilimanjaro. As an explosive ordnance disposal technician in Afghanistan, Zambon's legs were blown off by a buried bomb. 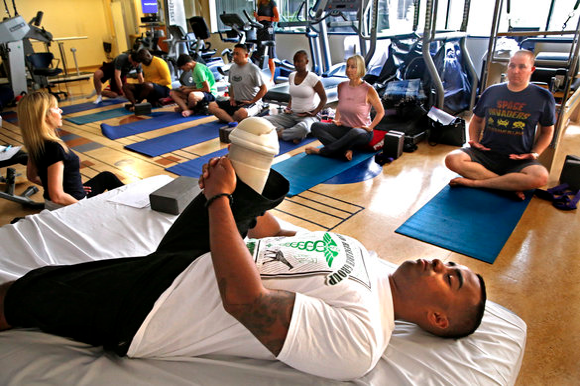 "Yoga has been one of the pillars of my recovery," Zambon, 28, said by telephone from Florida, where he will soon become an instructor at the explosive ordnance disposal school at Eglin Air Force Base. He has refused to accept a medical retirement or disability pension. Wearing prosthetics and accompanied by Tim Medvetz of the Heroes Project in Los Angeles, Zambon scaled Kilimanjaro in mid-2012, 18 months after his injury.